Click the image to visit the Western Drone Show website! We recently had the pleasure of operating in the heart of the City of Winnipeg, as we flew over the Red River, next to the Esplanade Riel Bridge, the Canadian National Museum of Human Rights, and a stunning view of downtown Winnipeg. The team volunteered their time to help out with the live streaming of the 2017 Winnipeg Gutsy Walk for Crohn's and Colitis Canada. We were able to live stream the event as hundreds of people walked to raise money and awareness for the diseases. M3 Aerial uses the Inspire 2 multi-rotor UAV platform to capture high resolution imagery for cinema, infrastructure inspections, etc. M3 Aerial uses the DJI Matrice 210 RTK multi-rotor UAV platform, equipped with thermal and 30X zoom sensor capabilities. Elmwood High School in Winnipeg is on the frontier of the tech industry! In 2016 we started up a UAV / Drone Club at the school, where we worked with young people who saw an opportunity in the drone industry and wanted to learn more! Students received free UAV Ground School training (the same that we offer in our training courses) and got to play with some pretty cool tools! We offer a hands-on, skilled training course for RPAS operations, ranging from simple to complex. Wind Turbines are incredibly difficult to perform annual maintenance and inspections on! We provide our clients with extremely high resolution imagery for inspection / assessment of windmills, solar farms, and other energy infrastructure. We had the pleasure of presenting at the 2017 Crop Connect Conference in Winnipeg. We discussed the applications of drones in agriculture, and the training and educational requirements for implementing them properly. We were fortunate for the opportunity to fly at the Teulon Golf and Country Club, about an hour north of Winnipeg. It was stunningly beautiful! We spent all day flying up and down the golf course with our drones, capturing videos to create a virtual tour of the links. Check them out in our Services section. M3 Aerial Productions uses remote sensing to capture Near Infrared (NIR) images and converts them to NDVI to see where plants are growing well vs. poor. Aerial Imaging helps identify areas within crops that are suffering, that would otherwise be difficult to see from the ground. Fly directly to problem areas and see what is going on from 3 feet above the field! It's not what you think! This is not a field of marijuana, it is in fact, hemp. Hemp is used for many, many applications and for a long time now, the industry has been stymied by government policy that doesn't properly separate hemp and marijuana. It's a growing industry! NDVI helps farmers know where their fields need attention. Colours dancing over a lake near Glenboro, Manitoba. 60th Anniversary of The Farm; family in from all over! Help your home sell faster by using the aerial photography professionals! In 2017 we began using Propeller Aeropoints - GPS-enabled ground control points (GCPs) which allow the user to calculate extremely precise elevation metrics over huge areas by combining them with the use of drones. We are quite happy with them! M3 Aerial Productions uses Remotely Piloted Aircraft Systems (RPAS), also known as Unmanned Aerial Vehicles (UAVs), or simply "drones," to provide various aerial services and RPAS Pilot Ground School Courses from Vancouver, Edmonton, and Winnipeg, all the way to Halifax, and everywhere in between! We currently hold an active National Standing SFOC (Special Flight Operations Certificate) from Transport Canada. This allows us to operate in all classes of airspace (except A and B), any where in Canada, any time, day or night. We are at the forefront of the industry, and have the pilots, equipment, and service to meet your requirements. We are one of a handful of companies across Canada that are registered with Transport Canada as RPAS Ground School training experts, and our course "UAVs in Industry" has helped almost 500 drone operators get their pilot certification since new regulations were brought forward in 2016 governing commercial UAV operations. Our instructors are professionals in aviation and education, with a decade of military experience in the Canadian Armed Forces. Our 2-day UAV Ground School Course is available in cities across Canada, and could be offered at a University near you! We've just announced a few new dates and locations for upcoming courses across Canada! Check them out at our Courses page to see when we will be coming to your city next! M3 Aerial Productions will provide specialized aerial imaging services, and RPAS Pilot Ground School Training that is considered to be of the highest standards in Canada. Our program will educate pilots to be responsible and proficient RPAS operators. We will deliver affordable, captivating services to help our customers integrate aerial data collection in their operations. Click the Image to view larger! We were fortunate enough to be audited by Transport Canada. We are proud to be the first university credit level UAV Ground School course offered in Western Canada, with Brandon University offering Applied Topics in Geography: UAV Ground School in the fall session of 2017. M3 Aerial has been in the news quite a bit recently! 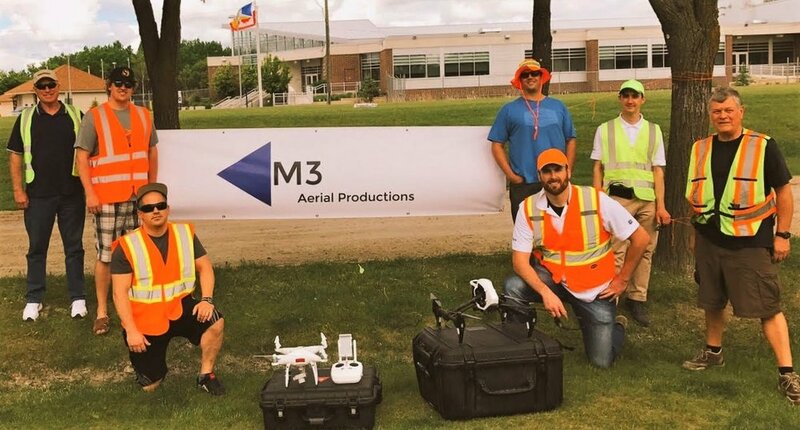 Please visit our Media page to read about how M3 Aerial Productions has been leading innovation in the Canadian Drone Industry. We are proud to be named as one of the Top 7 Drone Visionaries in the Precision Agriculture commercial market! Click the link to read more about how we have been contributing to the industry! Please visit our Media section to see some of the articles our company has been featured in! We are quiet proud of our feature on CTV News, here! We currently hold $5MM aviation liability insurance. Matthew Johnson, President of M3 Aerial Productions Inc. is a former member on the board of directors for the Manitoba GIS User Group; a community of dedicated GIS professionals looking towards increased understanding and use of Geographic Information Systems (GIS) for spatial data management, analysis, and visualization. 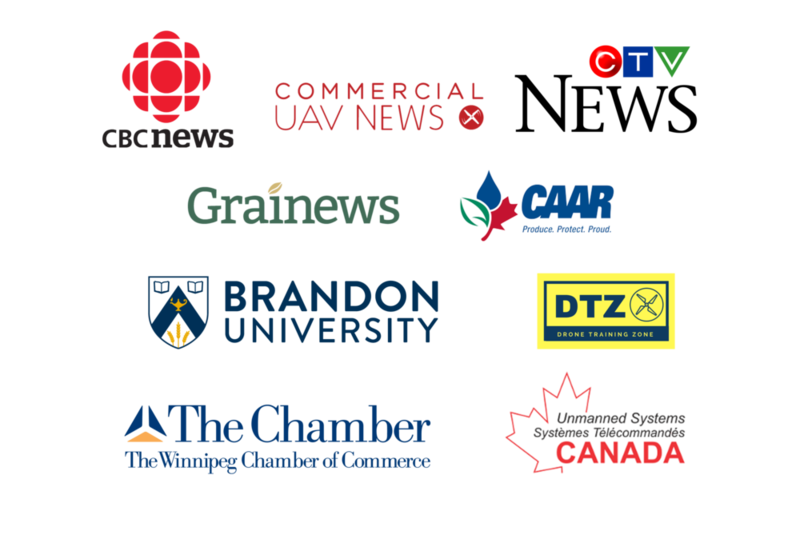 We are members of Unmanned Systems Canada, a not-for-profit organization dedicated to promoting public awareness, education and appreciation for the Canadian unmanned vehicle systems community to itself, to Canadians and worldwide. We are members of CARAC (Canadian Aviation Regulation Advisory Council), helping to assess and recommend potential regulatory changes through cooperative rule-making activities in conjunction with Transport Canada. Dronemeisters.com is a global UAV enterprise showcasing the worlds most accomplished drone photographers and cinematographers. Dronemeisters pilots have demonstrated the highest degree of skill, professionalism and safety, while providing their clientele with a wide range of superlative drone services. We currently have an active network of over 100 drone pilots across Canada. These people have completed our UAV Ground School training course and have applied for and have either received, or are currently awaiting their SFOCs from Transport Canada. If you are interested in joining our team as an "on call" pilot, please Contact Us, we'd love to hear from you! This is a national initiative designed to direct awareness towards two diseases that affect too many Canadians, and to help raise funds through the sharing and donations of aerial photographers across Canada and the Earth! Please visit Drones4Crohns.org and tweet #Drones4Crohns to help spread the word!